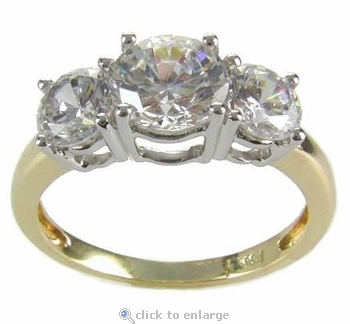 This Rio Three Stone 1 Carat Round Cubic Zirconia Two Tone Anniversary Ring is a popular style ring that represents the past, present and future of your relationship with the one you love. It features a 1 carat 6.5mm round diamond look center stone with .50 carat 5mm side stones for a total carat weight of 2 carats of the finest diamond simulants. Match this anniversary ring up with the anniversary band or eternity band of your choice to create a fantastic wedding or bridal set. 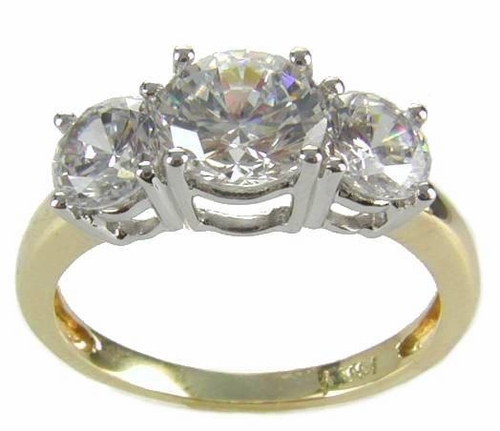 The sparkling 58 facet round cubic zirconia stones are all hand cut and hand polished to exact diamond specifications. 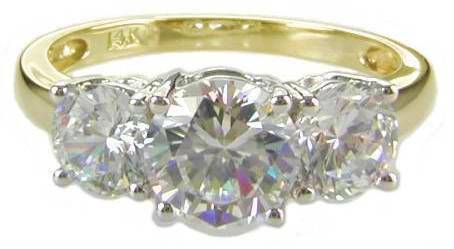 The two tone option features a 14k yellow gold shank with a 14k white gold basket to hold each of the three brilliant round cubic zirconia stones in four prongs. A lifetime warranty is included for all of our Russian formula cubic zirconia stones, please see the policy page for full details. Due to the extremely low prices, all clearance sales are final.